Usually I am blogging about shoes. Or shoe care. Sometimes music. 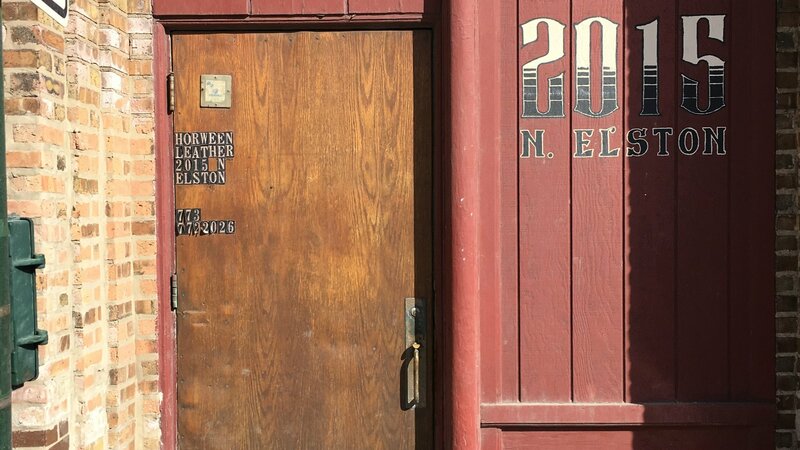 But in this blog post, I will be covering my February visit to Horween Leather Company. It was arranged by an Alden sales rep (thanks Brett! ), that I had met through my blogging activities. Even though the visit was in Chicago (2000 miles from Seattle), on a Friday (work day), and in the middle of winter (arctic), I jumped at the chance to go when offered. There is already a good deal of information on Horween Leather on the internet. 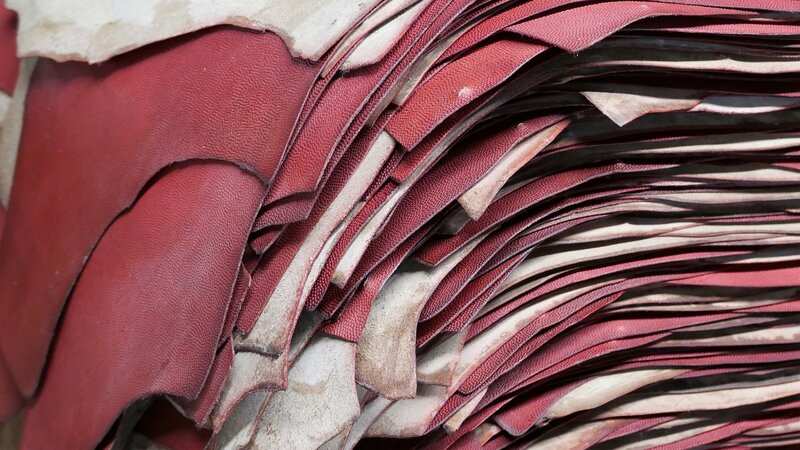 It’s a topic often covered when writing about Shell Cordovan (Horween’s most famous leather), and its long history. Most articles are quite good. 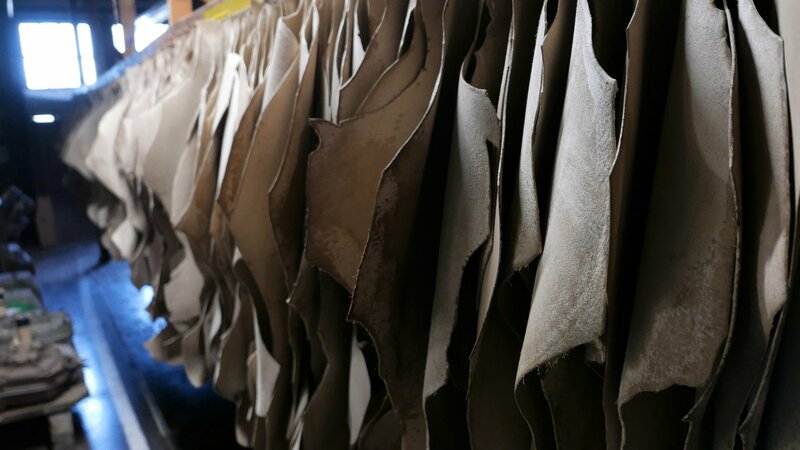 I am not sure I can do better and write a better article but for better or worse, I will try to better your knowledge of Horween leather and their tanning processes. Guiding us on our tour was Skip Horween, the President of Horween Leather. Skip is a nice, thoughtful man. He and his son, Nick Horween, generously spent nearly three hours taking us through the factory and describing the various manufacturing processes and leathers. 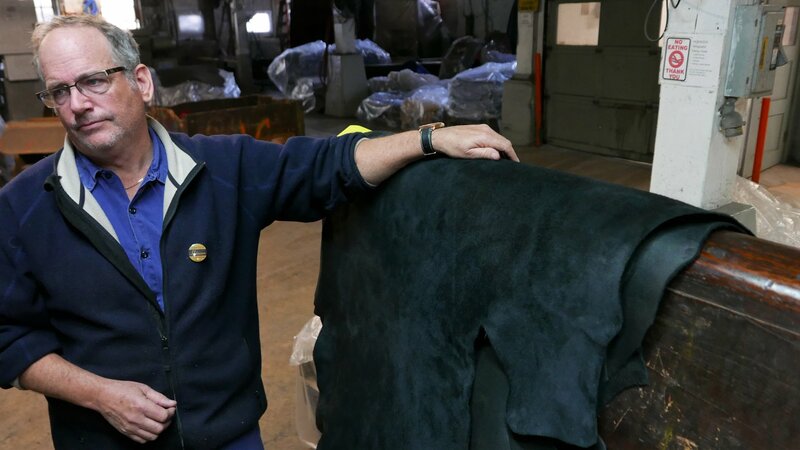 Having worked at the factory much of his life, Skip has a deep knowledge of the business and knew all the details of the tanning process. There was nothing pretentious about Skip. In fact, Skip wore a factory work shirt and pants like many of the other employees. 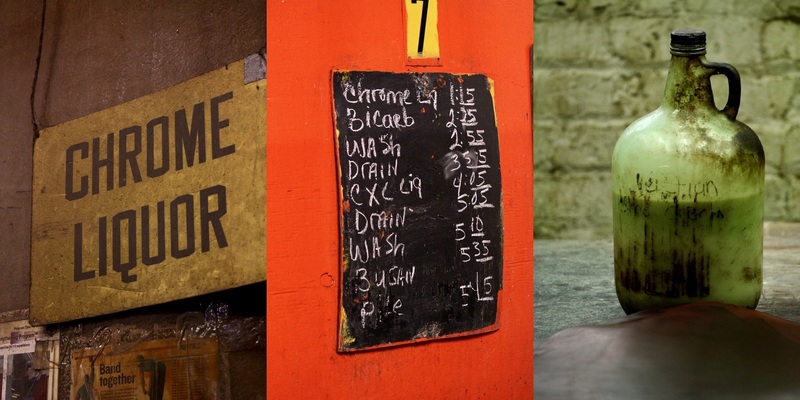 Touring Horween is like stepping back in time. 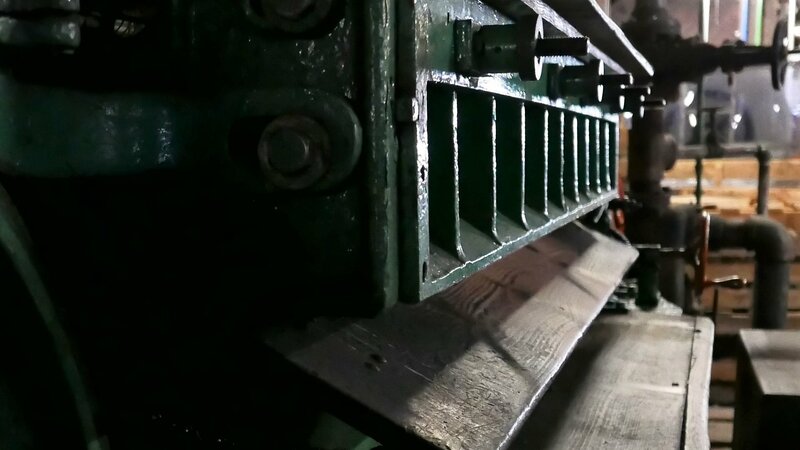 Much of the manufacturing processes date from the era when the firm was founded in 1905. The tanning process has evolved but still largely uses the same tanning recipes and steps that were established prior to World War I. 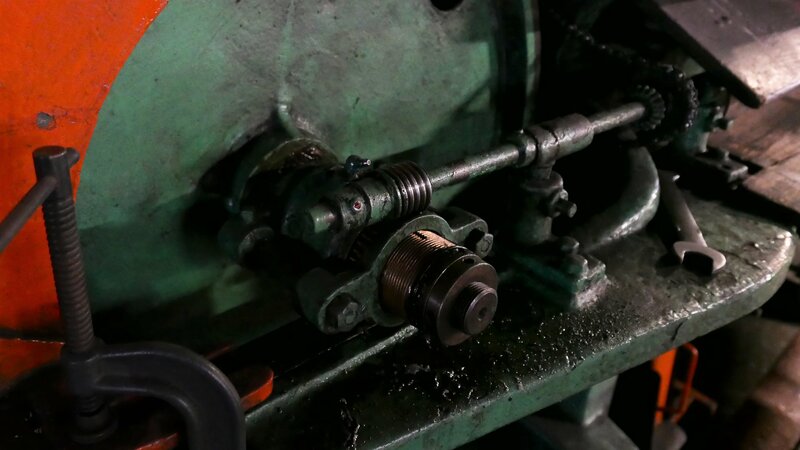 Even some of the machinery is over 100 years old. 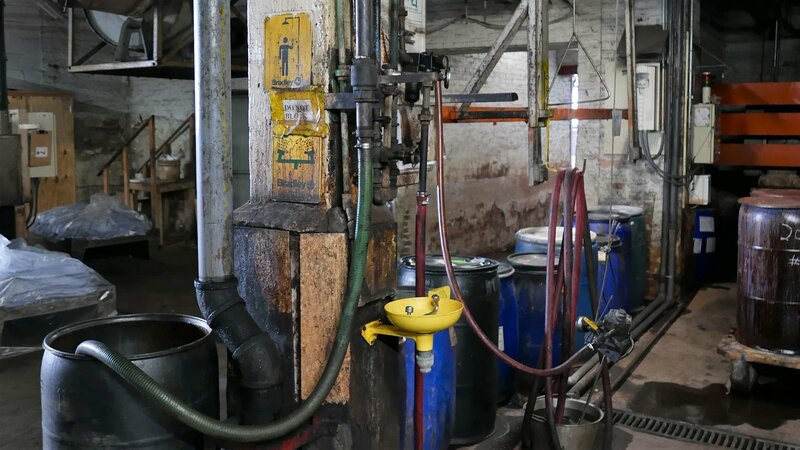 Machines had been refurbished but remained largely manually operated. 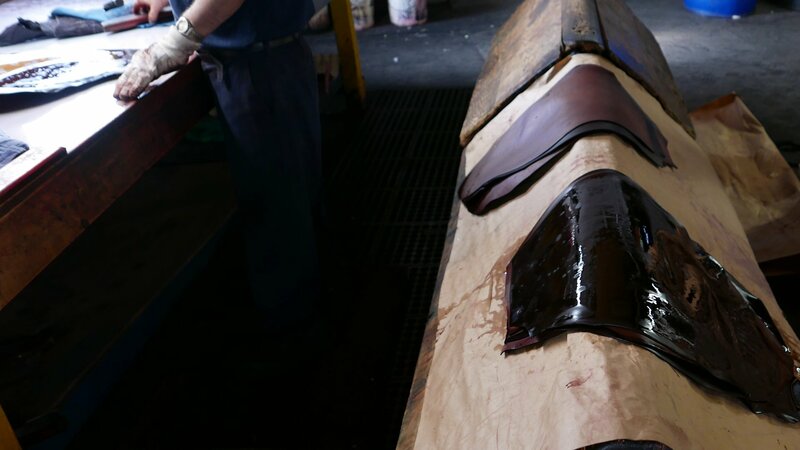 Because of these traditional processes, Horween can continue to produce a consistent, high quality product. 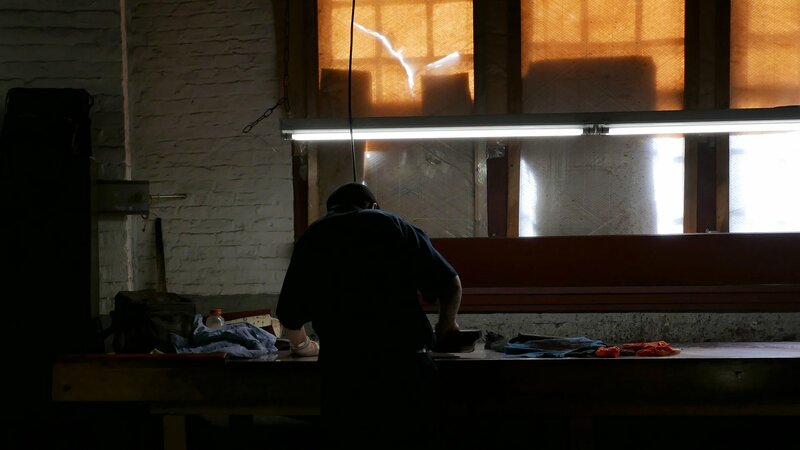 Horween Leather factory covers a block in north Chicago. It’s an older building that has five floors. The basement is where much of the tanning process occurs. 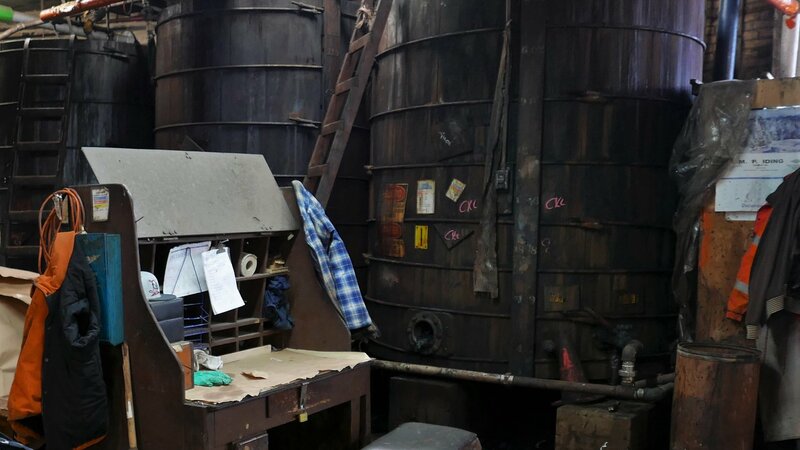 It houses deep pits for vegetable tanning the leather as well as large drums used for chrome tanning and “hot-stuffing” (impregnating leather with oils, waxes, and greases). 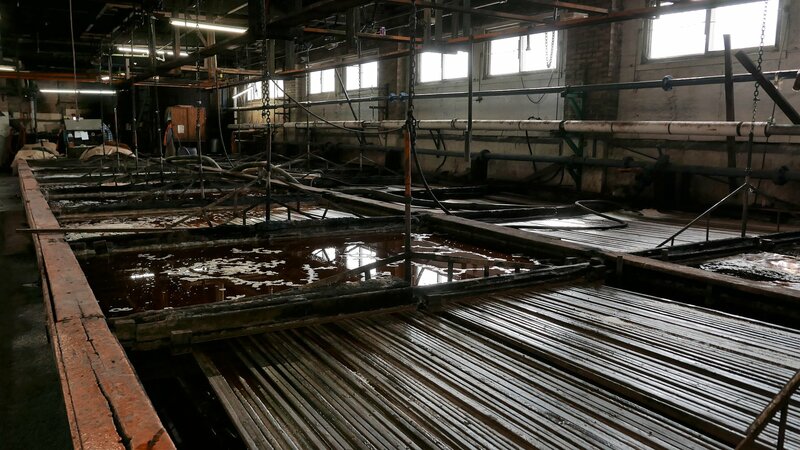 The upper floors of the factory were largely used for drying, finishing and storing the leathers. Horween predominantly tans steerhides. 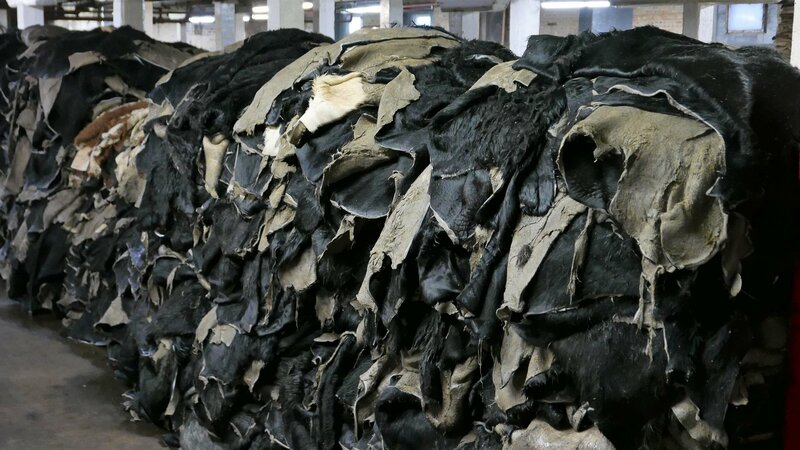 The hides are sourced domestically from the meat industry. Horsehides are used to produce Shell Cordovan. The horsehides are from France or Quebec and again, sourced from the meat industry (it’s not uncommon to see horse meat on the menu in Paris. Maybe it’s common in Quebec too but I stick to poutine when there). The basement had pallets of these raw hides still with hair. This was the only area that had a strong smell (like a farm). They did say though that the factory can be a bit ripe in the hot Chicago summer. 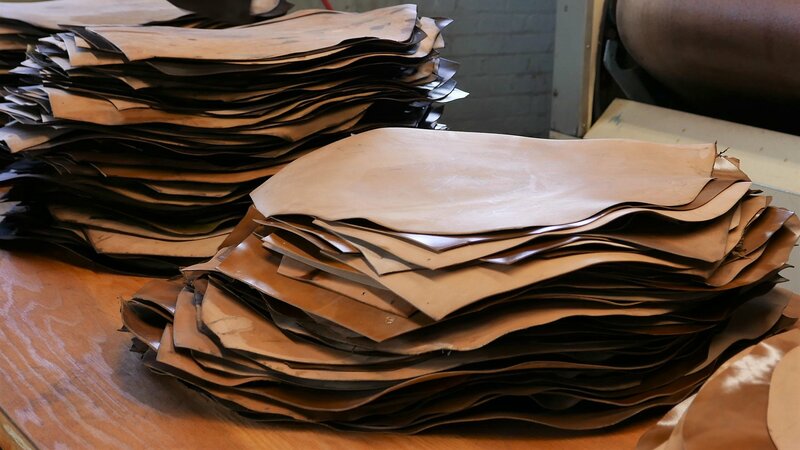 Although best known for Shell Cordovan, Horween produces 50+ leathers according their website. Each leather type has specific characteristics and can be chrome tanned, vegetable tanned or use a combination of the two. A couple of their most famous steerhide leathers are Chromexcel and the tough, pebble grain leather used on NFL footballs. Horween does not produce exotic leathers like alligator but has produced small quantities of leathers from farm raised deer and bison. We also spent some time in Skip’s old school office and where we discussed the history of the firm, the shoe industry, and a few of their current challenges. His office walls were filled family and business mementos. His visitor chairs were loosely draped in finished hides. Because I was interested in vintage shoes, Skip shared a few stories about the old shoe manufacturers. At one point, Skip expressed a bit of annoyance that Hanover sold Shell Cordovan pairs at a discounted price. He said it like it was fresh in his mind, but Hanover ceased production 30 years ago. Skip said he had looked at my blog and we talked briefly about the Florsheim Yuma posting. He pulled out an old Yuma pair and said he encouraged Florsheim to make the model again in Shell Cordovan. The production of Shell Cordovan took much of the tour time. 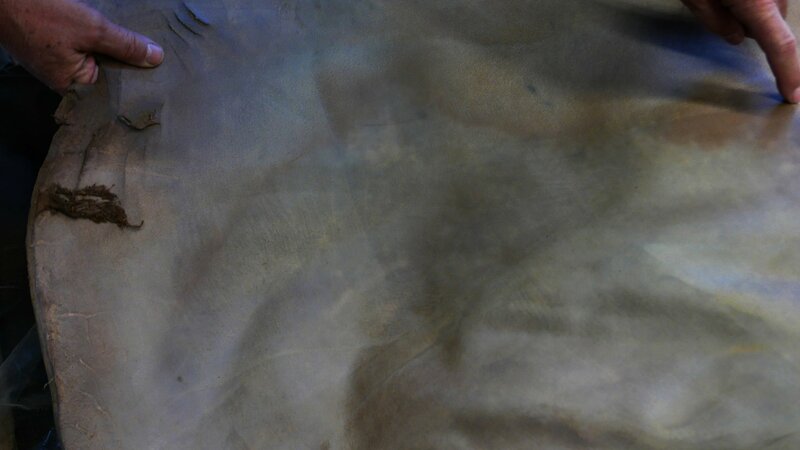 In case you didn’t know (but I think you do know), Shell Cordovan is tanned from a visually identifiable membrane located in the hind area of a horse. A single hide can produce two “shells” and a pair of shoes requires both shells. 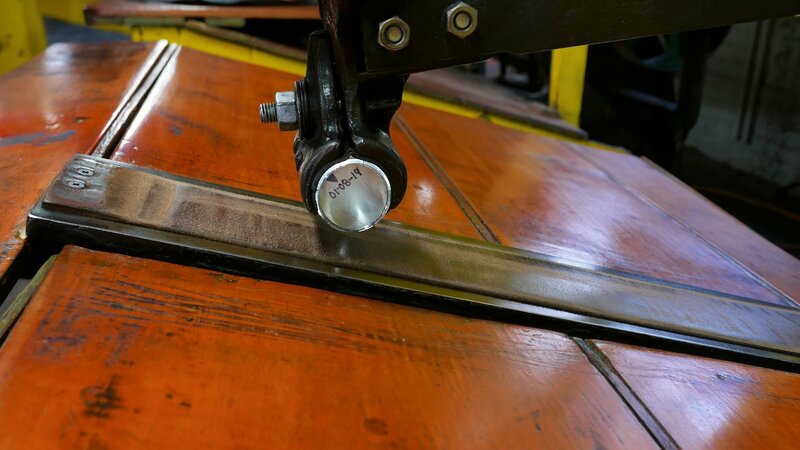 And they will be a good-looking pair of shoes due to natural shine of the tight grained leather. 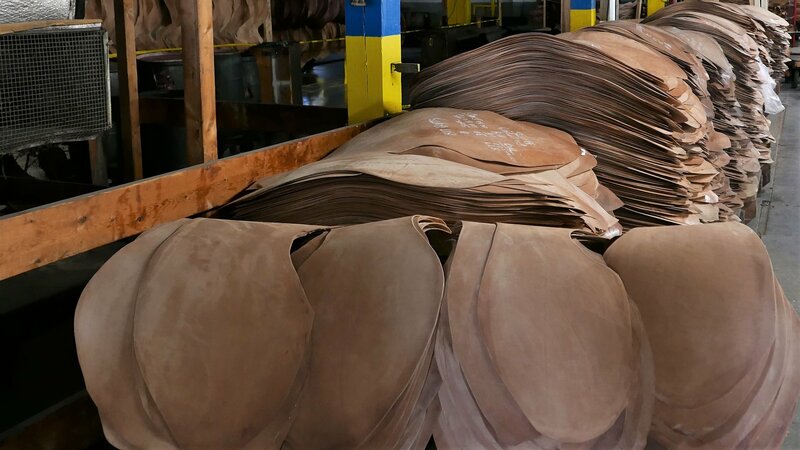 Horween has been producing Shell Cordovan since the founding of the company. The production takes around six months. Near the end of the process, the shell is colored and then glazed with a glass roller. Horween decides the color to manufacture and it is somewhat dependent of characteristics of the hide. We saw black, Color 8 and bourbon shells being finished. 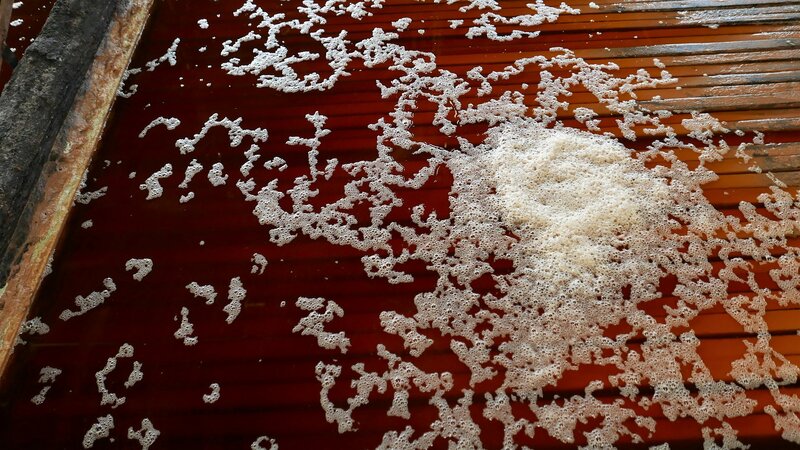 Quality assurance relies on visual inspections and is often followed up by touching the product. If it fails inspection, it fails. The grade of the finished shell is based solely on size. Skip didn’t want a flaw in the shell to cause an issue while making or wearing a shoe. Skip said that Shell Cordovan is “a pain to make, a pain to work with, but nothing else looks as good when you get it all right”. Horween is modern link to the vintage shoes that I write about because it is one of the few remaining suppliers to the formerly massive American footwear manufacturing industry. The footwear industry consolidated and then largely collapsed in the 1970s and 1980s as the demand for welted shoes weakened. The rapid factory closings also bankrupted many of the supplying tanneries and tool makers. That Horween was able to survive and thrive is a testament to its products and business practices. 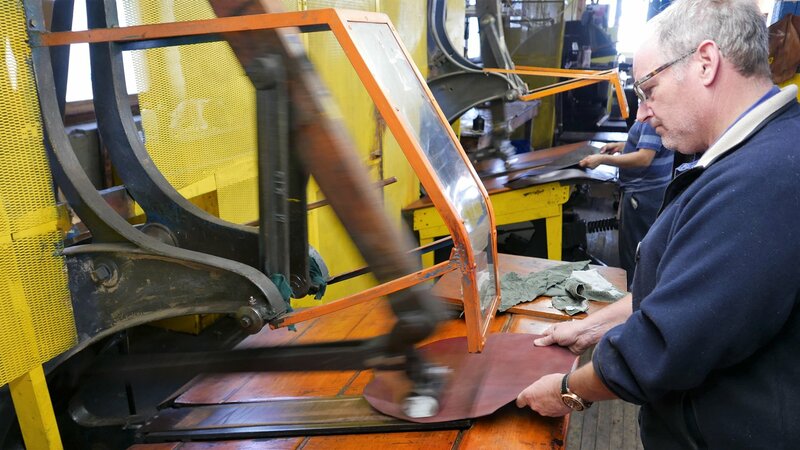 Given the traditional processes and machinery, Horween Leather is a living example of US manufacturing history. In this regard, it’s a national treasure. I live in Chicago, on the Northwest Side. Dang – wish I’d known – would have loved to join you for the tour. I really enjoy your blog, David. Perhaps we could petition our government to repatriate the shoe industry? I recently acquired a pair of black 96624 I found on your watch-list. Thank you. “Suicide heels”, indeed. Concerning shell, the “ravello” color (color 4?) sure looks like candy in advertisement photos, but it seems color 8 must be way more popular. Thanks. I would like the government to first focus on motivating teenagers. Hey David – that was a fun day. So glad Skip and Nick had the time to take us through. 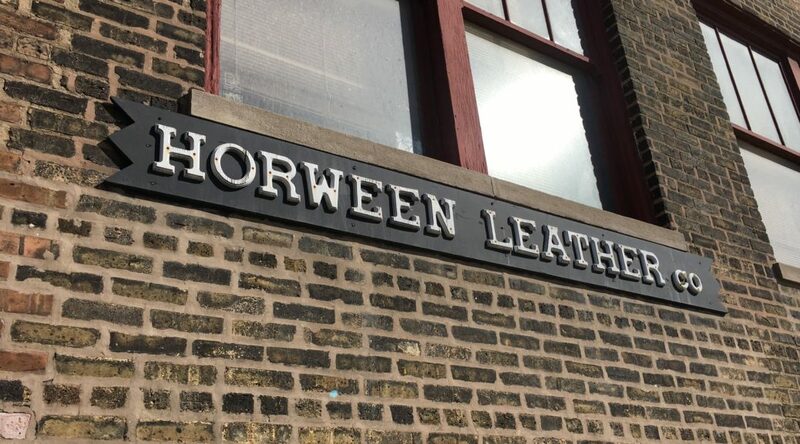 One little bit of info that I have always found fascinating about Horween, and which also offers some perspective of the industry today versus 100 years ago, is that in the early days of Horween 100% of their production was shell cordovan (no calf, no cow, no steer). That’s an incredible reflection of not only the shoe industry, but also the automobile industry (no one’s riding around on horses anymore), and probably the farming industry. So little horse available these days compared to yesteryear. Looking forward to meeting up again sometime. Cheers! Yes, it was fun. Thanks again. The French obviously need to eat more horse burgers. This was a fascinating virtual trip – thank you. What a great shoe this is! David, really interesting! Please write more posts about iconic American companies that I have driven past hundreds of times and had no idea they were there. Did they give you any outlook for their business in general? Seems as if they’ve survived this long they would be fine. Pretty sure Horween has been used for baseball gloves too. Any other uses? Great write-up, but the photos are really well composed and added as much to the post as the words. Thanks. The factory was just so interesting. The photos give just a glimpse of it. David, I loved this article as with everything you write. Thanks for your insight. I had a partial impromptu tour there last October while I was in Chicago for business. Great people, just as you said. 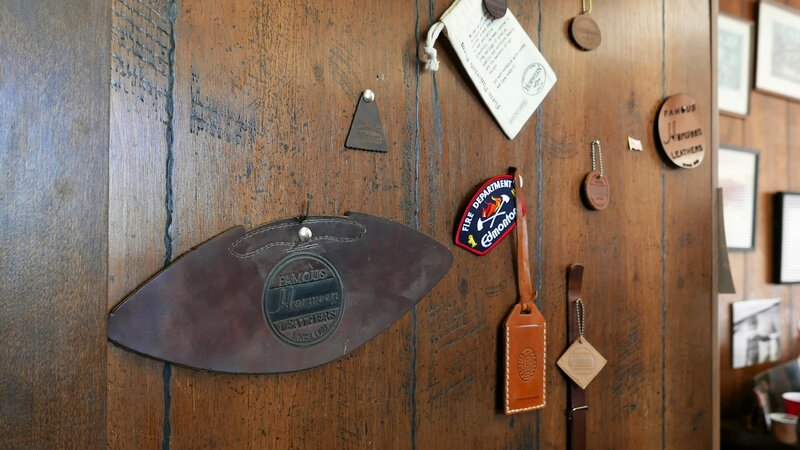 Thanks so much for taking the time to give all of us fans of Horween such a thoughtful glimpse into the inner workings and history of a great American company. I enjoy all of your articles and this one, especially so. Your site is such a wonderful resource that I use regularly and would sorely miss if it didn’t exist. Thank you. Very kind words. Just found this site recently. Excellent info! I’m a 15aaa and my job requires formal attire about 5 days per month. Nobody makes my size anymore and I’ve been reluctant to buy used. After binge reading the blogposts on this site, I bought up just about all the decent looking 15aaa and aa dress shoes I could find on eBay. Very happy and busy cleaning/polishing my new collection! Still hoping for some Cordovan wingtips to pop up in my size. Yes, that is a tough size to find. Glad you found some pairs on ebay.